This soup makes you want to get all cozy. It’s warm, creamy, and super yummy! BUT it’s also healthy and so easy to make! 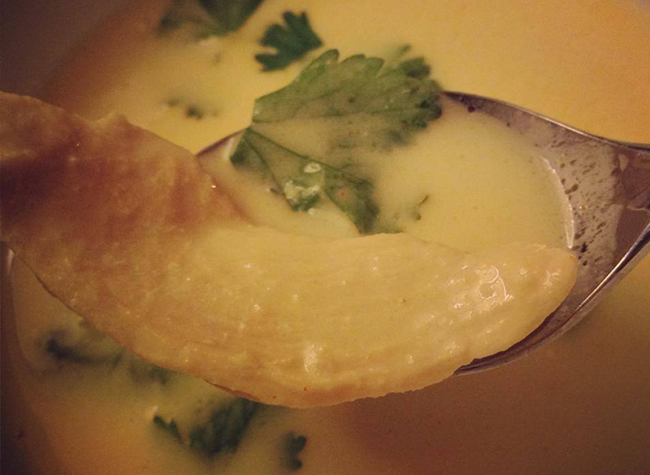 I call it Yummy and Lime-y because lime is a big flavor in this soup. Make some for your family today! Check out this lovely soup. It is so good! It's creamy (but it's dairy free), it's got the tangy taste of lime, and chewy chicken. I call it Yummy and Lime-y because the lime flavor is one of the main flavors. It's DELICIOUS! Cut chicken into thin strips. Heat oil in a pot and saute the chicken for a few minutes. Add coconut milk and water and bring to a boil. Reduce heat. Add ginger, fish sauce, lime juice, cayenne powder and turmeric. Simmer until the chicken is done, about another 10 to 15 minutes.